apparently there is no simple way to get my blog updates on facebook so i don’t feel like i have to maintain my life in two places. one is hard enough (as you can see by my lack of updates lately). it can’t be this difficult or rare to want a solution. i’m now a proud member. this post is to test rss integration. feel free to ignore it. 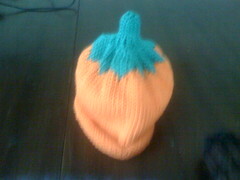 i have been knitting, honest. if anyone, ANYONE, recognizes that last colorway as a yarn they enjoy, please please tell me what it is… cuz i threw away the label and i can’t for the life of me remember what brand/type it is and it’s driving me nutso. not unlike a year ago, my day will consist of dog stuff. 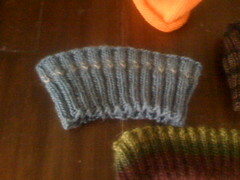 and knitting. not sure about the huevos rancheros. i can’t remember if i made those at home or if the diner was open last year. we’re about to head over to where kurt’s mom is staying to walk her dog (along with ours), hopefully the temperature outside will cooperate. the dogs have been quite antsy because we’re not really walking them in these temperatures, just letting them out back to run and poop. i know i complained about that exact thing, but my excuse is the weather. 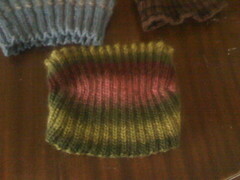 i’ve started working on a cowl, which isn’t turning out nearly as pretty as the one to which i’ve linked. i’m not yet sure who the recipient will be. it’s not orange, so i won’t keep it for myself. time to get out of the pj’s. when we were in the process of buying our home, i realized that i would have to give up my insatiable sushi habit due to the high monthly cost i was incurring enjoying a healthful dinner nightly. for real. it was ridiculous. well, kurt and i have found our new favorite sushi joint: takumi. the owners used to own takara on state street, so the interior is reminiscent. the menu is pretty much the same, too. and the head chef knows us now, so he yells “Irasshaimase!” when we show up, which basically means “welcome” or “come in!”. p.s., sorry about the lack of updates, the content in my life is a bit lacking right now. plus it’s cold out. i took kurt out for dinner last night at the tornado room. it had been a while (quick blog search), according to my blog it’s been four years, but i don’t think that’s correct. it was pretty good.. not as excellent as it’s been in the past. kurt blamed the economic climate cuz that’s the funny thing to say. my salad was visibly smaller than in the past and his meat wasn’t as tasty. the bread was really good, and of course the martini’s were, too. it was nice to see rick (he used to work at mickey’s) and bob (who was in for his dinner–also used to work at mickey’s). we felt right at home. until i have 12 days off in a row. this week can’t go fast enough. i had a teacher once make it very clear that in order to not sound like a fool, you had to pronounce poem, “pome” but make the o sound more pretentious. anyway, i’ve never really had an appreciation for poetry, other than shiel silverstein, dr suess, lewis carroll, roald dahl… you know, the rhymey-types. i tried getting into e e cummings, but that was simply because of his use of lowercase. i woke up with this awesome blog post in my head and have since forgotten about it. i had a weird work dream last night that involved my cube falling apart, someone tripping over it and suggesting i call facilities. then one of the facilities guys came to my house to break down and rebuild all my bookshelves because the wood was toxic. on another note: people at work are already scheming about how to get out of here early. i’ve been trying not to flagrantly toss my money about as much.. but if i could, i’d buy this. the orange one, of course. but i know i’d rarely use it. omg. i’m in love with this website. this ring is awesome. and i think i could justify this doormat. sorry guise, i keep updating my post. i think i found what kurt’s getting me. adult-sized footy pjs.